This addition to UNITY's City Voices and Perspectives series highlights Louisville’s data-sharing between schools and youth-serving groups. 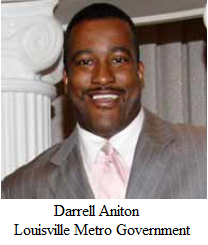 Darrell Aniton describes how this coordinated system enables community organizations to identify and engage students most in need of support, improve programs, and demonstrate their effectiveness using academic and attendance records. Louisville is a member of the UNITY City Network. Join UNITY at this legislative briefing on how partnerships across sectors can address multiple forms of violence. Program Coordinator Benita Tsao will also recommend state policies for preventing violence, based on the UNITY Policy Platform and input from a UNITY convening for state health leaders. Register for the event, hosted by the Center for Health Improvement. “Preventing Violence, Promoting Health” also features Dr. Howard Spivak, director of the Division of Violence Prevention at the Centers for Disease Control and Prevention, Lisa James of Futures Without Violence, and Andrea Flores Shelton of the Santa Clara County Public Health Department. Students at TVbyGIRLS in Minneapolis produced this short video on the city's Blueprint for Action. Funded in part by UNITY, the 10-minute documentary includes remarks by Mayor Rybak, other local leaders, and UNITY Co-Chair Billie Weiss. Some of the filming took place at the UNITY City Network Convening in Minneapolis in October 2012. As Congressman Keith Ellison remarks in the video, “By saying that violence is a public health issue, we’re saying there is something we can do about it.” Watch the video and read the event summary. Prevention, and in part by The Kresge Foundation. For more information, visit www.preventioninstitute.org/unity. Learn about a new online tool, Understanding Evidence, from the CDC's National Injury Center. Register for the webinar, co-hosted by Safe States Alliance, UNITY and Prevention Institute. Browse past issues of the City Voices and Perspectives publication series to learn about local efforts to prevent violence in cities such as Seattle, Denver and Minneapolis. Findings of a new Boston study show that low-income youth with summer jobs are less likely to fight and damage property, compared to their peers without jobs. Read more.